Give your appliances a new breath of life and preserve their maximum work quality for a longer period of time. In order to fully service its customers, “Solingen – Tzvetko Georgiev I sin EOOD” has introduced a full cycle of care for your professional needs. 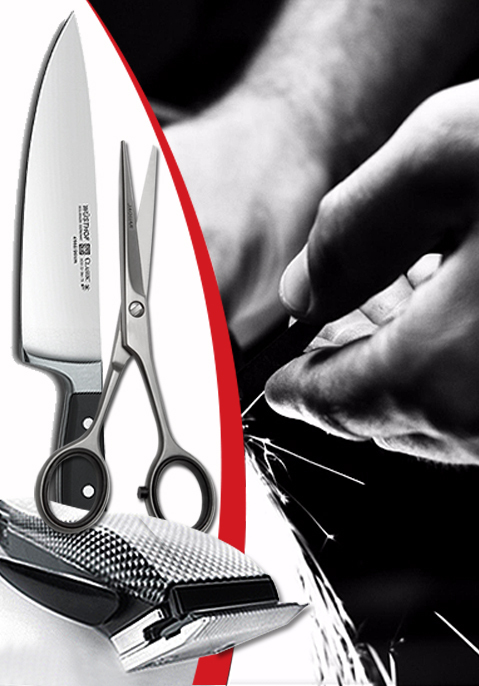 In our shops you will not only discover exceptionally sharpened and quality made instruments and hair dressing appliances for both professionals and home users but you can also count on full and constantly available professional care, repairs and sharpening services to prolong the exploitation of your instruments and appliances. Our sharpening services are available for: clipper blades, scissors (for hair, tailor, home, cuticles, nails), nippers (nails, in-grown nails, cuticles), manicure instruments as well as the sharpening of knives (home use, professional, hunting, pocket, forged, etc.). “Solingen – Tzvetko Georgiev I sin EOOD” also provides service care and repairs of your appliances such as: hair clippers with cords, oscillating motor clippers, cordless hair clippers, change of batteries, hair driers, pressing and curling irons. * If you sharpen 8 of the same tools, the 9th tool sis sharpened for free. ** Express services entail a 60 percent surcharge to the price listed. Any tools which have been sent via courier and not submitted in person must be accompanied by a document that clearly states: whether the tool is only being sent for a check-up, whether the tool is to be sharpened only, any defects with an appropriate description of same, exact address for return of tools and a phone number for the customer. After a successful professional training of the service personnel of “Solingen – Tzvetko Georgiev I sin EOOD” in Germany, in the headquarters of Wahl, the service center was certified to be compliant with requirements and authorized to carry out repairs for the brands of Wahl, Moser and Ermila. The service center of “Solingen – Tzvetko Georgiev I sin EOOD” is the only authorized center for repairs of the above mentioned brands for the whole territory of Bulgaria. The company uses some of the most modern and precise professional sharpening machines, which allow for a perfectly sharp result and restoration of the cutting properties of your instruments.